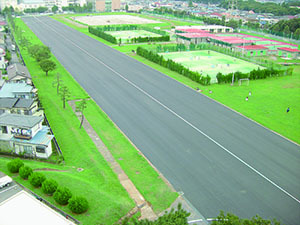 The Multipurpose Test Track for Automotive Vehicles was constructed at the Funabashi Campus in 1972 and was repaired in 2007. It has a dense graded asphalt concrete pavement that can accommodate various types of experiments, such as driving tests for aircrafts, automobiles, motorcycles and others. Different experimental research in the fields of Aeronautical Engineering, Mechanical Engineering, Traffic Engineering, Pavement Engineering, Ergonomics, Acoustical Engineering, Environmental Engineering and others, can also be undertaken. This facility is the only existing university-based Test Track of its kind in Japan. It is indeed unusual to have a testing facility of this type at a university anywhere else in the world. The Test Track is also widely used for experiments in various fields, responding to the increasing demands on the part of researchers for facilities that allow full-scale experiments. The Test Track is 30 meters wide, and has a 618-meter long straight lane that permits simulation of freeway traffic conditions and runways. Visit the Test Track website below for further information.